Designed to maintain a classic ambiance, our dress codes and club policies are part of what defines the Duquesne Club’s legacy. Club casual attire may be worn in the Pine Room at all times, Garden Patio, First Floor Bar, Grill Room during the dinner period (Club Traditional Attire for lunch), Reading Room, Health & Fitness (casual and fitness attire permitted), and while checking in and out of overnight bedrooms. Club traditional attire should be worn in the Grille Room & Red Room during the luncheon period, Duquesne Room, and Library after 5:00 p.m. Private dining rooms and suites dress codes are to be determined by the host, within standards below. Club casual attire includes collared shirts, turtleneck sweaters, or knit or golf type shirts with collars, tucked in to tailored trousers or khakis. Ladies may wear blouses or sweaters with tailored skirts or slacks. Club traditional attire includes a coat and tie for men; ladies must be comparably attired. Children should be conservatively dressed at all times. The Club’s adult dress code applies to children ages 12 and older. Talking on cell phones is prohibited in areas commonly enjoyed by other members, including corridors, lounges (including the Reading Room), ´ à la carte dining rooms, bars, elevators, rest rooms, exercise rooms, and the Barber Shop. Talking on cell phones is permitted in enclosed phone booths and stationary courtesy phone locations, private dining rooms, private suites, hotel rooms and locker rooms. Text messaging and silent reading of materials displayed on cell phones, tablet size computers, and electronic readers are permitted in public areas. To protect the privacy of members, camera and videotaping features of cell phones may not be used in any area. Members and guests wishing to examine the contents of briefcases, review business documents with another person, and use laptop computers may do so only in private dining rooms, private suites, courtesy booths, the Founders Room and Library when not in use, and the Health & Fitness dining room and lounge area. Business documents may not be reviewed with another person in ´à la carte dining rooms, lounges (including the Reading Room), or corridors. Smoking is only in the following areas of the Club: First Floor Bar (members and their guests enjoying food and beverage service only – not banquet attendees) and designated hotel rooms. 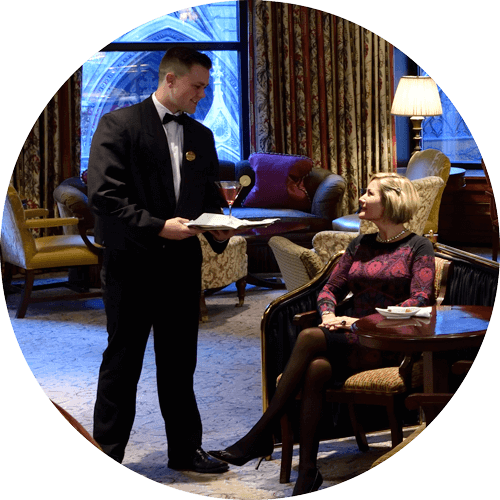 Smoking is not permitted in any other area of the Club, including private and non-private dining rooms, the Reading Room, the Library, the Billiards Room, corridors, rest rooms, and elevators. Exceptions may be made at the discretion of Club management for events that include cigar smoking for fundraisers conducted by nonprofit and charitable organizations. The event must meet all criteria of Pennsylvania Bill No. 246. These guidelines are subject to change to comply with Allegheny County’s and/or Pennsylvania’s smoking ordinances.